I can change it 'round some too. I got things I ain't even tried! And I got friends on the Other Side..."
A Witch Doctor is a type of sorcerer whose magic style is shamanic rather than arcane, and is often some sort of spiritual leader or teacher. Like many European wizards, he's mysterious and downright creepy even by the standards of his environment. That's why he lives well away from everyone else and doesn't wash much. His hut is filled with dried and pickled remains of unpleasant and unidentifiable critters. If he doesn't have explicitly magical powers, then he may be a wetware version of the Mad Scientist. You go to him because he might have a better plan or advice than other rubes, but no one wants to actually talk to him. If he's smart, he knows it and will remind you frequently. Unlike the Mentor, he's concerned with your quest and possibly be a little fond of you, but perhaps not your particular survival. He is usually completely frank and your success is all he really seems to be rooting for. Even in recent times, most Witch Doctors have a semi-obvious ethnic derivation; the most tolerated currently is Jamaican/Caribbean (normally Haitian) and most will have a Vodoun slant. The Witch Doctor can also be a villainous character, what with voodoo getting the treatment it usually gets in Hollywood. If that's the case, expect his general griminess to be played for creeps rather than laughs. Other times, they may be an example that Dark Is Not Evil. Traditionally, Witch Doctors healed supernatural ailments and broke curses. Doctors for witch problems, in other words. In the "Witch Doctor" commercial for Dr. Mario, a Witch Doctor sings part of David Seville/Ross Bagdasarian's "Witch Doctor". After being beaten at Dr. Mario, the Witch Doctor shrinks the head of a man, who remains alive to recount the tale. If you run into one in any anime or manga story, they will either be wise Chinese scholars, priests of some extraction (usually Shinto), or skin-wearing shamans. Kururu from Sgt. Frog may be considered a Mad Scientist version of the Witch Doctor. He's a creepy, sneaky Insufferable Genius who spends most of his time in his lab. And whenever he helps someone (even one of his squadmates), there's almost always a catch. In Violine, Kombo is one who can actually see into the future, but due to his whiskey addiction and old age, he is not too good at it anymore. Qumi-Qumi has Bai-Baba, the shaman of the magic-based Juma-Qumi tribe. She's one of the highest powers of the tribe, second only to the chief. She seems to be one of the sanest members as well and is one of the only members of the tribe to treat Juga with any respect (though even that's limited, as he's her failure of a student). She's also the owner of the Solar Sheep (which power the sun) and (formerly) owned a pair of voo-doo doll zombies. In the Discworld of A.A. Pessimal, Howondaland has its Witch Finders. Based on unexaggerated accounts in Real Life, but ramped Up to Eleven, the College of Witch Finders of the Zulu Empire ticks all the boxes for a local equivalent of Unseen University, teaching magic to an exclusively male brotherhood. They act as an intelligence and spy service, and are effectively a clandestine power and a Secret Police for the Paramount King. note As they were for Zulu Kings on our world They also control were-power, and native Weres are recruited as were-leopards, were-vultures and night-flying vampire birds. They also believe magic is the sole prerogative of men and, as the name implies, are resident witch-hunters. Various charaacters in the Pessimal Discworld run up against them. With their misogynist bent about magic, it is a serious shock when they encounter Lancre-trained witches for the first time - who also have definitive ideas about a woman's place in magic. In Madagascar: Escape 2 Africa Melman becomes the witch doctor of a herd of giraffes after the previous one died. Turns out he didn't. Dr. Facilier, a shady New Orleans occultist who deals in spells, curses and pacts with dangerous spirits. Mama Odie is a good version of this trope, and fits the "hands-off" mentor role nicely. She could have snapped her fingers to undo the spell Facilier cast on Naveen and Tiana, but thought it better to let them figure it out for themselves. The Wizard from Conan the Barbarian (1982) is a perfect example of this: he is Asian rather than the usual Jamaican/Caribbean, but he wears clothes made of seaweed and he seems quite mad. He turns out to know his stuff, however. Tia Dalma, first seen in Pirates of the Caribbean: Dead Man's Chest seems to be the living incarnation of this trope — her little hut has the fixings for everything, from rum to music boxes to human souls. Elzora, the creepy old witch in Eve's Bayou. She has some bad blood with Mozelle (herself a Hot Witch), though it's never revealed why. In Operation Petticoat, a South Pacific version of one of these is brought in to perform a blessing dance for the heroes' barely-operational submarine, on the theory they need any help they can get. His comment as the sub chugs painfully out of port: "They'll never make it." In the Mongolian film Khadak, the lead character is pulled out of a coma by a shamaness, whho tells him he must also become a shaman. Nanu's adoptive father Gazenga from The World's Greatest Athlete from the African jungle qualifies do to his talent for voodoo dolls and other such ticks. In New Zealand film Utu an old witch doctor with full tribal regalia gives the protagonist a warrior tattoo. The Discworld novels play with this. Many traditional witches and wizards deliberately cultivate an intimidatingly occult image because it's what people expect. Thus, witches wear pointy hats and black dresses and work with exotic herbs and improvised tools of magic, while wizards wear pointy hats and colorful robes, wield staves, and have a lab with occult books, dribbly candles mounted on old human skulls, and a stuffed alligator hanging from the ceiling. Much to the chagrin of many younger witches (who act more like stereotypical neo-pagans) and younger wizards (who act more like quantum physics students), the older wizards and witches do get respect. In Terry Pratchett's Nation, Mrs. Gurgle (real name unpronounceable by the English Daphne), who does get respect, and also help chewing her food. Professor Trelawney, the Divination teacher from Harry Potter, desperately wants to cultivate this appearance. King of the Water Roads opens up with a visit to one for a magical injury. While his treatments are successful, he is executed soon after for being a mage. In the Rowan of Rin series, a visit to their local example of this occurs in every book. N'Longa from Solomon Kane. However, he gets respect, and his power is immense, if subtle. A couple show up in That Hoodoo Voodoo That You Do by Ragnarok Publications. Charmed had once had a witch doctor who is neutral who specializes in exorcising angry spirits. He's also Genre Savvy enough to lampshade the fact that he appears to be a normal guy in a suit: "You were expecting a guy with a bone through his nose, right?" Law & Order: Criminal Intent featured a woman who claims herself to be a healer and uses tricks and chemicals to scare and scam the sick. This episode also featured a good voodoo healer who explains that all religions have good and bad people who practice it and claim that the scam artist just uses tricks and no magic. In Who Are You?, Si-ohn wakes up from a six-year coma, only to find that she has an I See Dead People problem. She visits Hee-bin, a shaman who says that "resentment" is what drives the ghosts to appear, and suggests that Si-ohn sees them because she wants to see them. This being a Korean Drama, Hee-bin is not some wizened old person but a hot young lady who likes to go dancing in clubs. Further episode reveal that while Si-ohn can see ghosts, Hee-bin can talk to them as well. Dr. Mbogo is The Addams Family's head witch doctor. When they are forced to call a normal physician they are outraged and scared, like a normal person would react by calling a Witch Doctor of course. In the Made-for-TV Movie Halloween with the Addams Family the already adult Pugsley is studying to become one (with the shamanic attire and all). Played heavily by Screamin' Jay Hawkins when singing "I Put a Spell on You" . Never trust a witch who mixes up her potions right there in the sink, and then tells you to drink up your "Love Potion No. 9". In its 2nd edition, Dungeons & Dragons introduced a Kitnote variant class traits bundle called the Witch Doctor in its "Complete Book of Humanoids" sourcebook. This was a priestly kit which shared some traits with the shaman (introduced in the same book), but had the unique ability to cast wizard spells, albeit from only a single school and at half the potency of their priestly spells. The kit vanished with the release of the 3rd edition, perhaps because of D&D's long-standing issue with Fantastic Racism often overlapping into Values Dissonance, but the concept survived as the Adept; a "primitive" magic-user NPC class with traits of both cleric and sorcerer. Ngangas in Spears Of The Dawn is this trope to a T. They're spellcasters whose magic deals heavily with the placing and removal of curses, and their ritual gear frequently includes masks. They're widely feared and distrusted, but having a nganga around is also acknowledged as necessary to protect a community from hostile magic. The Jungle Cruise at the Disney Theme Parks has Trader Sam, a mystical salesman who specializes in making and trading shrunken heads. Monster High's Jane Boolittle is based on an African witch doctor, with a mysterious staff, tribal wear, and the ability to talk to animals. While she remembers nothing of her past, she was adopted by Dr. Boolittle, a British scientist exploring her jungle, and was raised by Boolittle and his colleague, Dr. Moreau, before coming to the titular school. As such, her personality is less mystical, and more like a junior scientist with an analytical perspective on the high-school way of life. 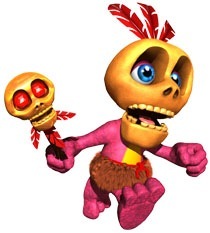 Banjo-Kazooie: Mumbo Jumbo and Humba Wumba. The former (current page image) handled transforming the main characters into various creatures such as termites, alligators and even pumpkins in the first game. In the sequel, he was actually playable and used different spells to interact with the overworld, while Humba Wumba took over the transformation business. The Voodoo Lady from Monkey Island. The Trolls of the Warcraft games have plenty of Voodoo Witch Doctors, complete with Jamaican accent, mon. They run the gamut from Dark Is Not Evil good guy types like Sen'jin, and monsters like Zalazane. Trolls also have the Shadow Hunter, the Magic Knight version of this. One of the new classes in Diablo III is the Witch Doctor, which appears to be quite similar to the Necromancer in Diablo II, who also have many similarities to witch doctors. He is deeply spiritual and one of the few priests to ignore the power struggles that have corrupted his religion. Defense of the Ancients: All-Stars and its remake has a hero called Witch doctor. He is a Red Mage with a decent healing spell and a set of very powerful (but situational) high-damage spells. The first boss in Maximo is a Witch Doctor who shrinks the hero down to a few inches and then tries to step on him! Momma Aimee, in Mystery Case Files: The 13th Skull, is quite willing to help the player character (in exchange for the completion of a fairly easy Fetch Quest). Among other things, she provides a sleeping potion that comes in handy, and teaches the difference between voodoo and hoodoo. Golden Sun: The Lost Age has two tribes of Fantasy Counterpart Culture Darkest Africans with "magical" leaders, both of whom appear to actually be Adepts. Naribwe is led by the guidance of a gentle (if scary-looking) fortune-teller who freely offers his services even to foreigners, if they let him study their belongings. Showing him the Laughing Fungus earns you hints of the plot ahead; if he sees your armor he'll tell you where you can find stray Djinn. Kibombo, when you arrive, is in a state of turmoil; their previous witch doctor died recently, and his apprentice, left to take the reigns, is a bratty teenager. Also, their chief deity is broken, so said teenager can't even get it to cooperate with the rite to make his position official. In Gems of War, the minotaurs are noted for their shamanistic beliefs, and the Soothsayer unit can use Soul Power magic. Witch Doctors appear as enemies in Borderlands 2's Sir Hammerlock's Big Game Hunt DLC. They come in elemental (shock, incendiary, and slag) as well as vampiric and paralyzing variations. They also have the ability to heal themselves, power up other savages, and turn into a tornado to reduce damage taken. In Shop Heroes, Azula is a spirit-guided shaman who has healing among her skills. Mal'Damba from Paladins is a sinister-looking witch doctor who fights and heals using his pet cobra and gourds full of venom. His ultimate summons a large snake spirit that scares enemies into fleeing uncontrollably. In Sinfest, one stunt tried to bring Fuchsia back to evil. Opal of Harpy Gee is a ratheer cute version of this. Nallan of Cut Time heals Rel's wound and pulls off an impressive display of magic against the assassin. Uncle from Jackie Chan Adventures is a Chinese witch doctor who specializes in chi spells. Found in an episode of Scooby-Doo, Where Are You! ("A Tiki Scare Is No Fair"). The witch doctor in question is, of course, fake. Zecora the zebra from My Little Pony: Friendship Is Magic is not at all bad, despite prejudice and rampant exaggeration on the part of the townsponies who convinced themselves she's an evil pony-eating enchantress. She's knowledgeable in zebra magic and other natural creatures, making her a good source for information that even Twilight's knowledge doesn't feature. The witch doctor in the original George of the Jungle looks and dresses the same as a traditional Western doctor. The remake has a more traditional witch doctor as a foil for Ursula's father, a modern doctor. Danger Mouse encounters a witch doctor in "Lost, Found and Spellbound" who has some fun at the expense of DM's dignity. Bugs Bunny encounters a witch doctor (1950's "Witch Is Which?") who needs a rabbit for his potion. Hilarity Ensues. In 1974, during a World Cup qualifier in Rhodesia (now Zimbabwe), the Australian soccer team got a local witch-doctor to curse the opposition, but couldn't produce the money when he demanded payment, causing him to switch the curse to the Australian team. The curse was used as an "explanation" for Australia's failure to qualify for subsequent World Cups, most notably 1998, when Australia was leading Iran 2-0 late in the final qualifying game (after tying the first game 1-1), only for Iran to score two late goals and qualify on away goals. In 2003, Australian television personality John Safran paid another witch doctor to remove the curse, and Australia then qualified for the 2006 and 2010 World Cups.